I have no idea who Dr. Oz is. I’m sure he knows his stuff. An article, by a likeminded chiropractor Dr Mercola, also touts the benefits of tea. “Research dispels the common belief that tea dehydrates. Tea not only rehydrates as well as water does, but it can also protect against heart disease and some cancers.” (http://articles.mercola.com/sites/articles/archive/2010/07/06/tea-healthier-drink-than-water.aspx). These learned and studied health professionals base their opinions on solid scientific evidence and studies. Why on earth would my 65 yr old patient be experiencing what she reports, if the properties of tea are so documented? Mercola goes on later to state, “There’s still some debate as to which kind of tea is the most beneficial — green- and black tea being the most cited, but you can also consider Indian herbal teas like Tulsi.” This statement confuses “herbal teas” with actual camellia sinesis, tea, and leaves one with the impression that green and black teas are the same. They are not. Nutritionism is the scientific position that, in effect, a whole is the sum of its parts and hence the parts constitute that which is important to the whole. Thus, what’s important about the apple is not it’s freshness, how far it had to travel, or deliciousness, per se, but its “fibre content,” its vitamin store, so on and so forth. Once you get so much fibre and vitamins, eating apples or anything for that matter becomes rather unimportant. This here Snickers-Plus has all the electrolytes, fibre, and B vitamins for three apples and two chicken livers… and it’s organic! Can’t beat that with a stick, now can you? Right there on the label, see fibre, vitamins,… hey and NO transfats! It really is good for you. Remember, even Oprah and the Dalai Lama endorse Snickers-Plus. Surely, you have got to be a Tea Party, conspiracy nut if you still insist on eating actual apples and liver! I digress, but only to contrast this position from that of Chinese medicine which takes the whole as the base unit of a bioactive compound, not its parts. The apple, to return to our previous example, is a whole, which possesses certain properties. Tea and herbal beverages also have properties, which in Chinese medicine are largely categorized upon taste. There are five recognized flavors, salty, sour, bitter, sweet, and spicy. Each has a certain predictable effect on the body, under certain circumstances. 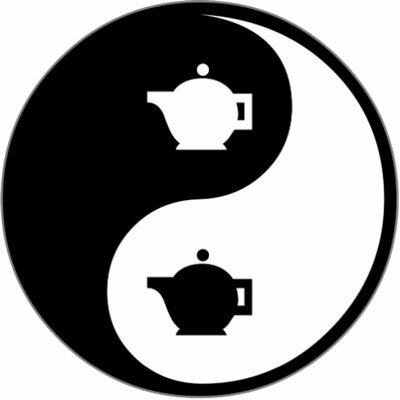 Let’s continue to cast the yin and yang of tea into something that we can understand on a practical level, while at the same time suggesting why such a casting is meaningfully different from nutritionism. Among the varieties of tea there are only three: green, oolong, and black teas. So-called “white” tea is just another variety of green, though milder. They all come from the same leaf, differing by their relative degrees of oxidation. Green teas are oxidized very little and are cool by nature. They are therefore considered yin. The more intense the green, the colder it is by nature, regardless if it is drunk with warm water or not. An example of a high-grade intensely green and cold tea is the Japanese Gyokuro. On the Chinese side of things there is Bitter Nail Tea, ku-ding cha 苦丁茶，which is rolled long as a nail and unbelievably bitter. It is drunk only in summertime and a solitary “nail” is used for several cups. Black teas are more yang in nature. This means that they are warming on the digestive system and can be drunk with greater frequency by those who have weak digestive systems, a condition marked by bloating, cramping, and an abdomen cool to the touch. Oolong tea is half-oxidized between black and green tea. It is perfectly balanced, so to speak. Some company in China, no doubt involved with the selling of its particular oolong product, made curious claims about some “research” substantiating the superior slimming effects of oolong versus its green and black siblings. Oolong has a distinctive floral taste. High quality oolong is intoxicating in its breadth, notes high and misty fill the senses, providing considerable delight to those who find drinking green tea rather like having grass-clippings. Traditionally, different parts of China favored different types of tea. In the central region along the Yang-zi River, green teas were the norm. These regions are temperate and humid. Green tea’s bitterness cools in oppressive summer heat and drains excess dampness. Bitter’s draining action is difficult to reconcile with the scientific findings on “hydration” above. More ironic still is that water isn’t considered particularly hydrating either, not in Chinese medicine. Oolong tea has been more commonly enjoyed by the Cantonese and Fujianese, those of the far south. In Hong Kong they may have taken up the drinking of black teas from India due to the British colonial presence. There are varieties of Chinese black teas which are quite nice, but they seem to be enjoyed primarily by the Cantonese. The ethnic minorities of the Southwest and Northwest rather universally drink black tea, brick being the most common among them, as it is regarded an essential digestive aid for the heavy grease of lamb and yak, the meats common to their diets. Processing tea can enhance or diminish the natural properties of the tea itself. Exotic Indian infusions of black tea, like Earl Grey and Darjeeling, invariably require some understanding about the properties of the essential oils used to gauge its effect on the tea’s over all nature, yin or yang. Northern China almost universally drinks jasmine tea, which is a green tea infused with jasmine. The jasmine seems to enhance the draining nature of the tea, judging from personal experience. The climate of the north is temperate and dry. Still, that’s what they drink. In instances where the body is characterized by hypofunction or a yin state, a yang tea is more appropriate. The opposite applies for the body in a state of hyperfunction. Tea in itself can NEVER be considered a yang tonic because it is yin by nature. It is not a yin tonic either, because by being bitter its function is to drain downwards: detox in other words. The point is, however, that if the body is characterized by hypofunction, detox should be the last thing on one’s mind—the body is looking for support. What good are all the health-promoting properties of green tea if the body principally requires warming? To put it another way, no meaningful benefit from any herbal beverage can be garnered without understanding that beverage’s yin-yang nature relative the yin-yang state of one’s own body.